At first, young Sally June Esh's tragic death doesn't look like murder. Even in peaceful Blue Sky, collisions between buggies and Englisch cars aren’t unheard of. Still, the Eshes are skilled drivers used to delivering their popular pickles for miles around. And after Kappy notices Sally's buggy was deliberately run off the road, her ex-Amish friend Edie gets strange texts saying the crash was no accident . . .
Kappy won't let her community's silence keep justice from being done. And even though a still-shunned Edie thinks of moving back to the city, she and Kappy start rooting out secrets about the Eshes' long-time neighbors—and new pickle-producing rivals. But when they learn that Sally's brother is secretly courting an Englisch girl, their investigation takes a disturbing turn . 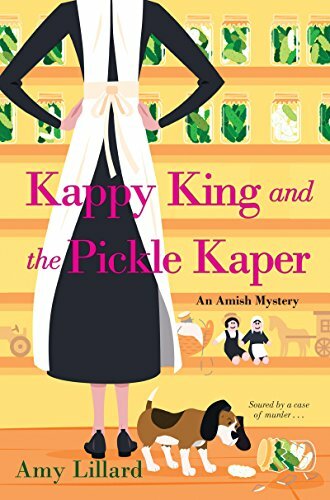 I love a mystery and Kappy King and the Pickle Kaper, did not disappoint! Amy Lillard gave such wonderful descriptions of the Amish community of Blue Sky making it seem so real. I really felt like I was a long lost cousin who had just dropped in for a visit. With her little odd ways. Kappy remained my favorite character. I love that she never gives up on her faith but still has her own original thoughts and ideas. She makes up her own mind. Although this book has some sad times (it's a murder mystery), it's sprinkled with a bit of romance and some great excitement. It was a great enjoyable read. This book is a part of a series, but I feel that it can be read alone without a problem. I was given this book by the author but was not required to give a positive review.